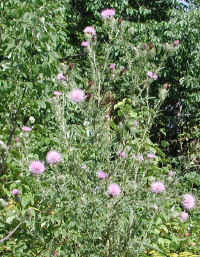 (Tall Thistle (Cirsium altissimum) - 01) This tall thistle is as large as a bush; in fact, these plants can grow to a height of ten feet according to several sources, and we believe we have seen even taller ones, perhaps even 12 feet tall. 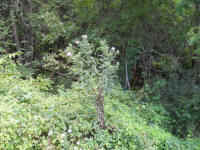 (Tall Thistle (Cirsium altissimum) - 02) This tall thistle seemed to tower more than eight feet high. 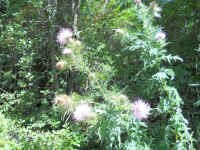 The National Park Service, on their web site, says that the usual height of tall thistle is 4-6, and this one is about double that size. 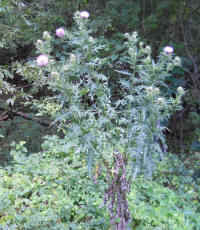 (Tall Thistle (Cirsium altissimum) - 03) This is not a bush; it's a tall thistle, and probably the largest one we've ever seem. We estimated the height to be 12 feet. (Tall Thistle (Cirsium altissimum) - 04) This is a closer look at this huge tall thistle that we estimated to be over 12 feet tall. (Tall Thistle (Cirsium altissimum) - 05) Almost every day, weather permitting, we walk the nearly three and one half mile round trip to pick up our mail. 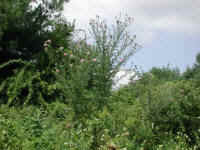 On the way back home on 31 Jul 2012, Mary, with mail bag slung over her shoulder, stopped beside this more than ten foot high tall thistle that was growing from the roadside drainage ditch, so we could take this photo. 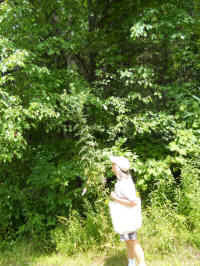 (Tall Thistle (Cirsium altissimum) - 06) This is a closer look at Mary beside the more than ten foot high tall thistle. 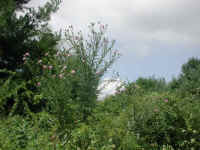 (Tall Thistle (Cirsium altissimum) - 07) On 6 Aug 2012, we took this photo of a tall thistle rising above the other plants and displaying its first flowers of the season. (Tall Thistle (Cirsium altissimum) - 08) This is a closer look at the top of the tall thistle. Note that the lower leaves are already dying. (Tall Thistle (Cirsium altissimum) - 09) This is another look at the tall thistle. 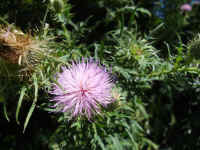 (Tall Thistle (Cirsium altissimum) - 10) This is closer look at one of the blooms of the tall thistle. 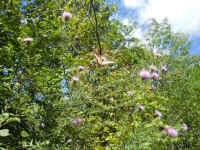 The USDA Natural Resources Conservation Service says that these tall thistle plants can be found in every state in the US from North Dakota to Texas eastward to the Atlantic Ocean, with the exception of Vermont, New Hampshire, and Maine. (Tall Thistle (Cirsium altissimum) - 10a) This is a closer look at the bloom of the tall thistle, which is made up of many individual flowers. Because of the many individual flowers in the bloom, wildflowers like this were considered to be a member of the Composite Family, but they have since been reclassified to be members of the Aster Family (Asteraceae). (Tall Thistle (Cirsium altissimum) - 10b) In this bee's eye view of the tall thistle, we can clearly see that it consists of many individual flowers, but unlike most flowers in this family, tall thistle do not have any ray flowers; they only have disc flowers. 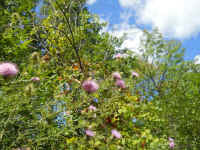 Technically, Missouri Plants describes the disc flowers as: Corolla pink to rose, to +30mm long, tubular, 5-lobed. Style well exserted (extending beyond). Achenes (seed-like fruit) to 6mm long, 2mm wide. 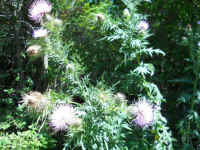 Pappus (feathery tuft of bristles on fruit) of numerous plumose bristles. 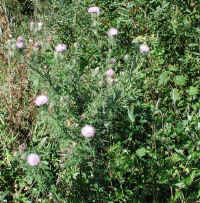 (Tall Thistle (Cirsium altissimum) - 11) This is another photo of a tall thistle. 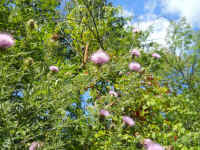 This native wildflower is a biennial or short-lived perennial. 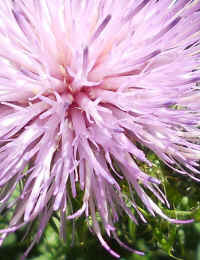 During the 1st year, tall thistle consists of a low rosette of leaves spanning about 1' across. 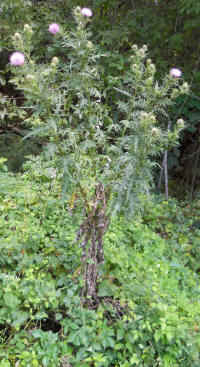 During the 2nd year and thereafter, it develops stems with alternate leaves and becomes much taller. 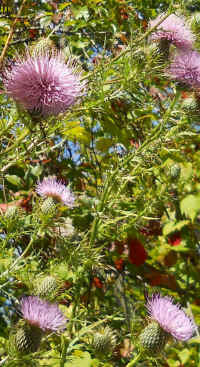 (Tall Thistle (Cirsium altissimum) - 12) This is another look at a tall thistle. 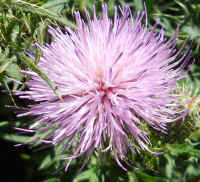 (Tall Thistle (Cirsium altissimum) - 13) This is an upper view of another tall thistle. 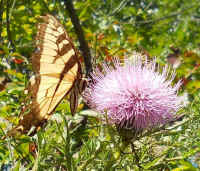 (Tall Thistle (Cirsium altissimum) - 14) This is another photo of the tall thistle with a visitor. 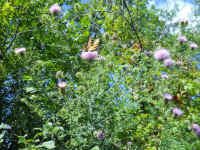 (Tall Thistle (Cirsium altissimum) - 14a) In this photo, we see the tall thistle's visiting butterfly, and the fact that tall thistles have thornless stems. 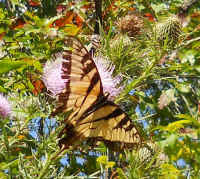 (Tall Thistle (Cirsium altissimum) - 15) This is another look at the visiting tiger swallowtail butterfly (Papilio glaucas) to the tall thistle flower. 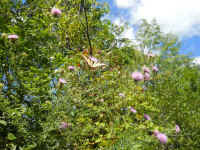 Note how ragged the trailing edge of the wings and tail of this butterfly are. He looks like he may have had an encounter with a predator or has just had a hard life. 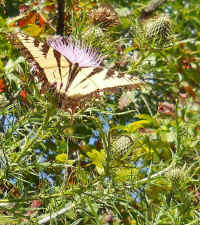 (Tall Thistle (Cirsium altissimum) - 16) The tiger swallowtail butterfly is flitting around on the tall thistle's flowers. (Tall Thistle (Cirsium altissimum) - 17) Our visiting friend settled down for some more goodies, and we were able to get this photo of him (yes, he's a male) on the tall thistle. (Tall Thistle (Cirsium altissimum) - 18) This is another look at a tall thistle. (Tall Thistle (Cirsium altissimum) - 18a) In this photo, we have a closer look at some of the newly developing tall thistle blooms. 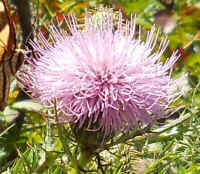 (Tall Thistle (Cirsium altissimum) - 19) This is another look at the newly blooming tall thistle. 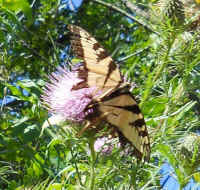 (Tall Thistle (Cirsium altissimum) - 20) This is a nice side view of the tiger swallowtail butterfly on the tall thistle bloom.